I am a mega fan of CBD, or cannabidiol, and am happy to sample all the things—tinctures, edibles, strains, and skincare products. However, I started to notice a pattern in my CBD adventures. First, I was extra impressed by a THC-and-CBD tincture that knocked me out during a transatlantic flight. 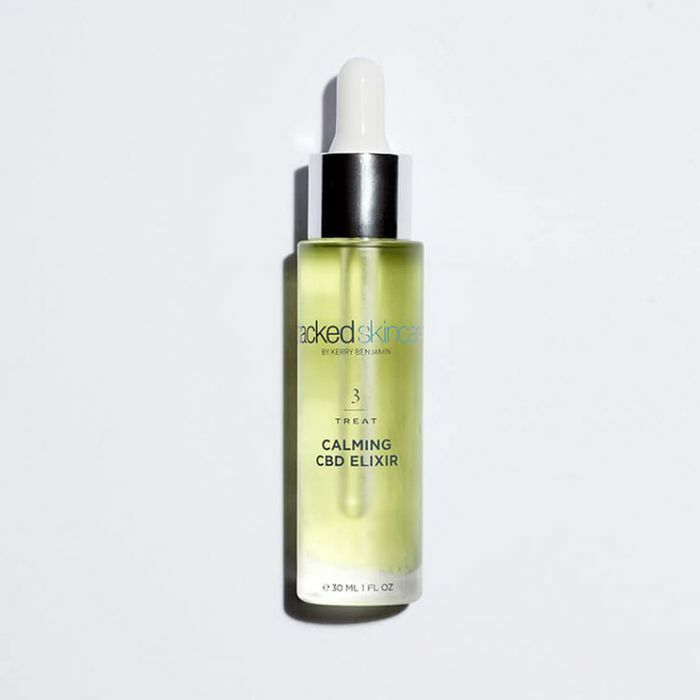 Then, a cannabis-sourced, nanotized-CBD beauty oil by RadRitual rocked my world by rapidly balancing and healing my hormonal acne. I couldn't help but wonder if it was worth taking a closer look at these success stories. The legal difference between CBD sourced from cannabis versus hemp comes down to THC content (the psychoactive component of cannabis responsible for making us feel high): Hemp-sourced products contain less than 0.3% THC, while cannabis-sourced products contain more than 0.3% THC. But whether hemp-sourced or cannabis-sourced, CBD-isolate—the highly purified form of cannabidiol that is extracted from either plant—is the same. In its stripped-down state, all the characteristics of the plant of origin are removed, leaving you with the purest form of the wellness wonder drug. But you would be cheating yourself of each plant's ample benefits if you took CBD in such a filtered state. Andy DangVu of Life Bloom Organics explains that it is the components added back to the isolate after extraction that really up the ante of health benefits—namely terpenes, aromatic botanical chemicals that give cannabis its distinctive flavor as well as its unique, individualized impact on the brain and body. Depending on the strain and person, terpenes can help treat symptoms like anxiety, insomnia, inflammation, pain, and nausea. Specific terpenes are what formulators use to create products focusing on the different wellness goals above. That's not to mention that there is a higher concentration of CBD in the cannabis plant, making it a more efficient source of the molecule than hemp. Still, even without terpenes, the medical benefits of CBD are praised by doctors, experts, and patients alike. "I believe CBD can be helpful to many common health struggles, including pain, anxiety, cancer, nausea, seizures, cognitive function, diabetes, and leaky gut," Josh Axe, DC, DNM, CNS, founder of Ancient Nutrition and DrAxe.com, adds. "Like healthy food and nutritional supplements, CBD can help to support your body healing itself." From sleep to skin to soothing your nerves, here's what experts want you to know about hemp-sourced versus cannabis-sourced CBD. "At the moment, aside from medically prescribed cannabis, most personal care products contain hemp seed oil derived from cold-pressing the seeds of hemp," shares Tina Hedges, beauty industry veteran and founder of Loli Beauty. "Hemp oil alone is still great for our skin, containing calming and healing compounds galore." The folks behind RadRitual, a brand that uses cannabis-sourced CBD in its beauty line, explain that "the main difference is that the cannabis plant naturally produces higher, more concentrated quantities of CBD than the hemp plant does. This means cannabis-derived CBD is often more pure, potent, [and] efficient." "Another benefit of cannabis-derived CBD [are] terpenes, which are naturally occurring in the cannabis plant," says the RadRitual team. "Terpenes have their own benefits and allow you to get very specific about treating different symptoms. For example, certain terpenes are great for treating insomnia, while others will be better for inflammation, while still others will be more targeted towards anxiety." It's worth noting that as of right now, figuring out which terpenes are right for you is really a matter of trial and error. Our advice? Start slow and really take the time to observe how you're feeling. "You should avoid any CBD products made with CBD that was extracted using toxic solvents like butane and hexane," notes Axe. "Residues from these solvents can be left over in the final products and negatively affect your health. CO2 extraction is the best method used to create CBD oil. This preferred method puts carbon dioxide under high pressure while maintaining a low temperature so that beneficial compounds are not destroyed by high heat." Still have more questions about CBD? Find our beginner's guide right this way.